DON’T let Silver Spoon Trattoria’s location on the first floor of a commercial building deceive you, for within its walls hides a contemporary and elegant restaurant specialising in Italian cuisine. Its vantage spot offers a view overlooking the streets of Bandar Menjalara, yet serves as a nice respite away from the hustle and bustle below. Something different: The owners of Silver Spoon Trattoria believe that the family-style Italian restaurant with a fine dining touch is exactly what the neighbourhood needs. The restaurant is also peppered with specially commissioned wireworks that double up as interesting interior pieces, like a wine holder in the form of a ship, and an eye-catching wall creation filled with an assortment of plates. Restaurant director Jessica Ng believes that Silver Spoon, a family-style Italian restaurant with a fine dining touch, is exactly what the neighbourhood needs as there are no other similar restaurants in Bandar Menjalara or its surrounding areas. “Everything in our restaurant has a personal touch — from the interior to the food, which is our main draw,” she said. “Silver Spoon started off with a very traditional Italian menu, but it has undergone a few revamps with the unpopular dishes removed. For starters, restaurant manager Kelvin Khoo recommended the Prawn and Avocado Salad — a refreshing salad made from a combination of grilled marinated prawns, avocado, radicchio, red onions, cherry tomato salad and cocktail dressing, and Stuffed Mushrooms — a popular appetiser featuring portobello mushrooms topped with bread crumbs, herbs and parmesan cheese. “Our Homemade Chicken Liver Pate is something that diners either love or hate, it is an acquired taste,” he said. Pizzas, pastas and risottos are the mainstays of any Italian restaurants, and Silver Spoon offers a wide variety. The Non-Cheese Spicy Tomato Pizza, which literally does not have any cheese, has a spicy “kick” thanks to the generous use of chillies. 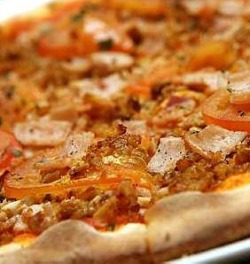 Soon to be incorporated into Silver Spoon’s new menu, this pizza has anchovies, turkey ham, chicken pieces and fresh tomatoes for its toppings. New on the menu: Non-cheese Spicy Tomato Pizza. Seafood fans may opt for the Garlic Prawn Pizza or Penne Aglio Olio with Seafood (prawns, mussels, squid and fish fillet). Another item to be included in Silver Spoon’s revamped menu is the Olive and Salmon Spaghetti, a tomato-based pasta dish featuring olive tapenade (a rich olive spread), salmon, cherry tomatoes and olive oil. Diners who prefer to sink their teeth into some meat may want the BBQ Beef Short Ribs braised in a sweet Asian infused sauce, or Braised Lamb Shank. “The lamb shank is braised in white wine, and served with vegetables, brown sauce and ratatouille made from an olive oil base,” said Khoo. Khoo also recommended the Grilled Butter Fish Fillet served with linguine pesto, pine nuts and topped with a capsicum olive salsa. Silver Spoon’s Tiramisu makes a delicious dessert to end one’s meal. 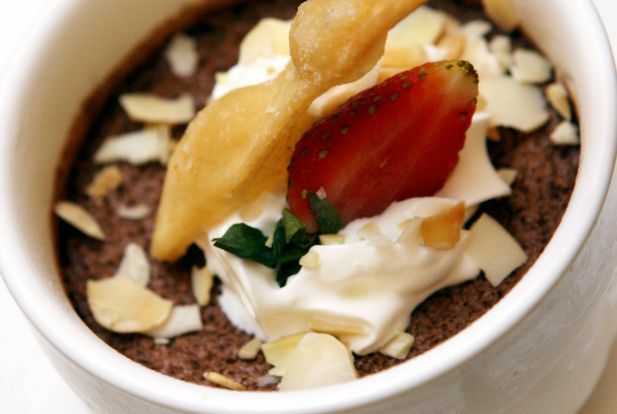 Alternatively, there is the Chocolate Pot, a dessert Khoo described as similar to mousse but with a more intense chocolate taste and flavoured with brandy. Ng said Silver Spoon is in the midst of expanding its drinks menu, which includes mocktails and smoothies like Jus De Fruit, Strawberry Surprise, Chocolate Banana Shake and Watermelon Shake. 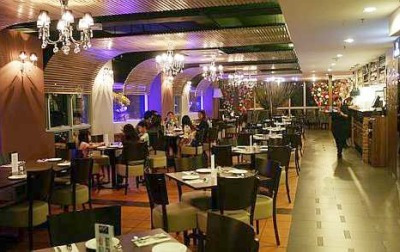 The restaurant, which features a casual and formal dining area, as well as a party room, is able to cater to 110 diners. Silver Spoon will be running a Father’s Day promotion from June 13-26 that is available for lunch and dinner. It features a family set for four or six, with a free mug of beer or sangria for the fathers. The restaurant also offers a lunch deal, which is priced at RM21.90 for a three-course meal. It is available daily, including weekends, from 11.30am-3pm.